This July sees the Court Star re-issued for the first time since the 80’s as part of PUMA’s revived Tennis category. In the 70’s and 80’s, PUMA unleashed a full court fury with its tennis shoes – they were exactly what players needed for grand slam level play. With soles that conformed to the foot in all white leather with occasional coloured Formstripes, they were a rising crowd-pleaser on courts around the world and it quickly put PUMA at the top of its game, attracting some of the world’s best players including German champion Boris Becker. Now PUMA is re-entering this field with its old time classics. Not to play in, but to live in. The Court Star re-issue is a slightly chunkier version of the PUMA Match hailing from the 80’s and is a classic in its own right. 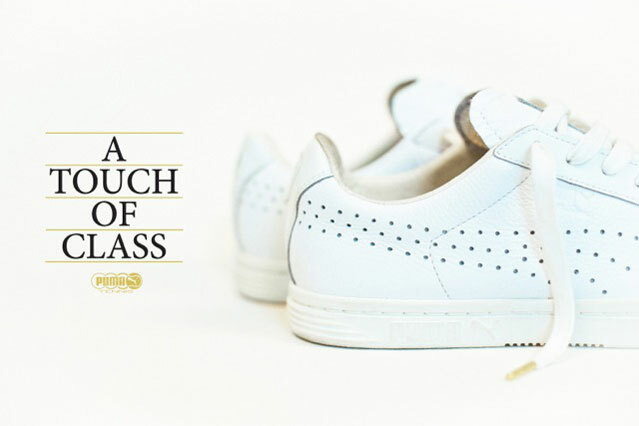 Its soft leather upper is highlighted by classic gold foil branding and a coloured midsole for an aged, vintage look whilst retaining the perforated Formstripe that has adorned PUMA tennis shoes since the 50’s. This original PUMA style is an all-round easy to wear casual sneaker with simple and clean tennis coding.